The versatile frog tongue can grab wet, hairy and slippery surfaces with ease, performing much better than our engineered adhesives. What makes them so uniquely sticky? How does one get stuck studying frog tongues? Our study into the sticky, slimy world of frogs all began with a humorous video of a real African bullfrog lunging at fake insects in a mobile game. This frog was clearly an expert at gaming; the speed and accuracy of its tongue could rival the thumbs of texting teenagers. The frog that was the genesis of the authors’ tongue research. Further YouTube research yielded amazing videos of frogs eating mice, tarantulas and even other frogs. The versatile frog tongue can grab wet, hairy and slippery surfaces with equal ease. It does a lot better than our engineered adhesives – not even household tapes can firmly stick to wet or dusty surfaces. What makes this tongue even more impressive is its speed: Over 4,000 species of frog and toad snag prey faster than a human can blink. What makes the frog tongue so uniquely sticky? Our group aimed to find out. Fast-forward 165 years, when biomechanics researchers Kleinteich and Gorb were the first to measure tongue forces in the horned frog Ceratophrys cranwelli. They found in 2014 that frog adhesion forces can reach up to 1.4 times the body weight. That means the sticky frog tongue is strong enough to lift nearly twice its own weight. They postulated that the tongue acts like sticky tape or a pressure-sensitive adhesive – a permanently tacky surface that adheres to substrates under light pressure. To begin our own study on sticky frog tongues, we filmed various frogs and toads eating insects using high-speed videography. We found that the frog’s tongue is able to capture an insect in under 0.07 seconds, five times faster than a human eye blink. In addition, insect acceleration toward the frog’s mouth during capture can reach 12 times the acceleration of gravity. For comparison, astronauts normally experience around three times the acceleration of gravity during a rocket launch. Thoroughly intrigued, we wanted to understand how the sticky tongue holds onto prey so well at high accelerations. We first had to gather some frog tongues. Here at Georgia Tech, we tracked down an on-campus biology dissection class, who used northern leopard frogs on a regular basis. The plan was this: Poke the tongue tissue to determine softness, and spin the frog saliva between two plates to determine viscosity. Softness and viscosity are common metrics for comparing solid and fluid materials, respectively. Softness describes tongue deformation when a stretching force is applied, and viscosity describes saliva’s resistance to movement. 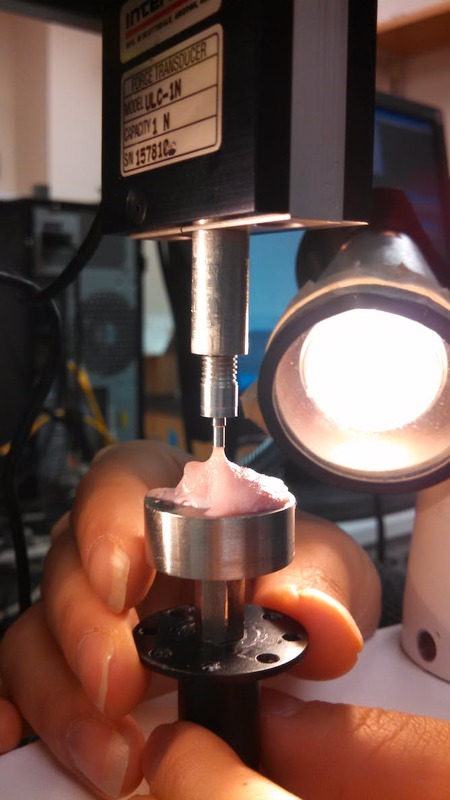 Determining the softness of frog tongue tissue was no easy task. We had to create our own indentation tools since the tongue softness was beyond the capabilities of the traditional materials-testing equipment on campus. We decided to use an indentation machine, which pokes biological materials and measures forces. The force-displacement relationship can then describe softness based on the indentation head shape, such as a cylinder or sphere. However, typical heads for indentation machines can cost US$500 or more. Not wanting to spend the money or wait on shipping, we decided to make our own spherical and flat-head indenters from stainless steel earrings. After our tests, we found frog tongues are about as soft as brain tissue and 10 times softer than the human tongue. Yes, we tested brain and human tongue tissue (post mortem) in the lab for comparison. For testing saliva properties, we ran into a problem: The machine that would spin frog saliva required about one-fifth of a teaspoon of fluid to run the test. Sounds small, but not in the context of collecting frog spit. Amphibians are unique in that they secrete saliva through glands located on their tongue. So, one night we spent a few hours scraping 15 dead frog tongues to get a saliva sample large enough for the testing equipment. How do you get saliva off a frog tongue? Easy. First, you pull the tongue out of the mouth. Second, you rub the tongue on a plastic sheet until a (tiny) saliva globule is formed. Globules form due to the long-chain mucus proteins that exist in the frog saliva, much like human saliva; these proteins tangle like pasta when swirled. Then you quickly grab the globule using tweezers and place it in an airtight container to reduce evaporation. After testing, we were surprised to find that the saliva is a two-phase viscoelastic fluid. The two phases are dependent on how quickly the saliva is sheared, when resting between parallel plates. At low shear rates, the saliva is very thick and viscous; at high shear rates, the frog saliva becomes thin and liquidy. This is similar to paint, which is easily spread by a brush, yet remains firmly adhered on the wall. Its these two phases that give the saliva its reversibility in prey capture, for adhering and releasing an insect. A South American horned frog demonstrates capturing a cricket in this slow motion video. How does soft tissue and a two-phase saliva help the frog tongue stick to an insect? Let’s walk through a prey-capture scenario, which begins with a frog tongue zooming out of the mouth and slamming into an insect. During this impact phase, the tongue deforms and wraps around the insect, increasing contact area. The saliva becomes liquidy, penetrating the insect cracks. As the frog pulls its tongue back into the mouth, the tissue stretches like a spring, reducing forces on the insect (similar to how a bungee cord reduces forces on your ankle). The saliva returns to its thick, viscous state, maintaining high grip on the insect. Once the insect is inside the mouth, the eyeballs push the insect down the throat, causing the saliva to once again become thin and liquidy. Frogs’ eyeballs actually help them swallow their food by physically pushing what’s in the mouth back into the throat. It’s possible that untangling the adhesion secrets of frog tongues could have future applications for things like high-speed adhesive mechanisms for conveyor belts, or fast grabbing mechanisms in soft robotics. Most importantly, this work provides valuable insight into the biology and function of amphibians – 40 percent of which are in catastrophic decline or already extinct. Working with conservation organization The Amphibian Foundation, we had access to live and preserved species of frog. The results of our research provide us with a greater understanding of this imperiled group. The knowledge gathered on unique functions of frog and toad species can inform conservation decisions for managing populations in dynamic and declining ecosystems. While it’s not easy being green, a frog may find comfort in the fact that its tongue is one amazing adhesive. Mark Mandica of The Amphibian Foundation collaborated on the research published in Journal of the Royal Society Interface and coauthored this article.